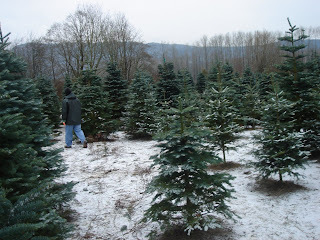 Today was our Annual Christmas Tree Hunt. There was a light dusting of snow on the ground as we took off to find the perfect tree. We were bundled up tight against the weather with scarves, gloves, hats and ski jackets. 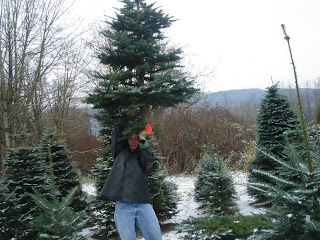 We settled on a seven foot Douglas Fir. 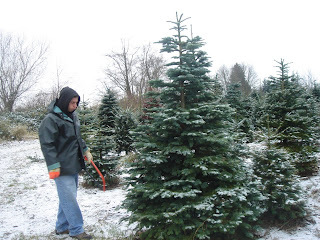 Here’s my hubby sizing up the best way to saw the froen tree down. Ten seconds later, success!The perfect Christmas tree for our holiday hosting joy is ours. Isn’t that fun? I totally love cutting down the Christmas tree with my hubby. It’s our 2nd year cutting our own tree and I’m hoping that we keep it a family tradition.